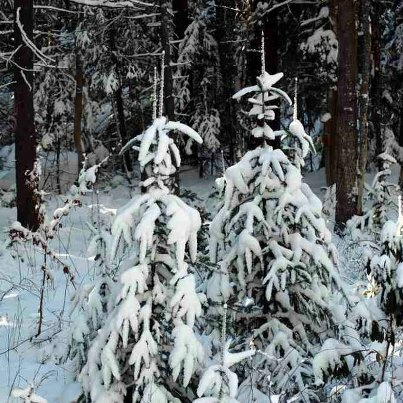 It's almost New Year and the Monadnock Region is beautiful with snow everywhere. It's a picture-perfect landscape at the Bridges Inn. Contact us for a reservation at www.bridgesinn.com or 603-357-6624. 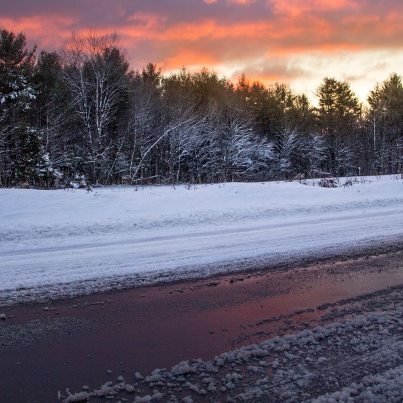 Whether you come to the Bridges Inn or to Mount Monadnock or any of the other winter attractions, such as Granite Gorge, you'll find plenty of winter fun in the Monadnock Region. Soften 2 tablespoons of butter. Mix 1 cup flour, 1 teaspoon baking powder, and ½ teaspoon salt. Set aside. With whisk or electric mixer, vigorously beat 2 eggs with 1 cup sugar. Add any flavors, such as splash of vanilla, lemon zest, almond extract, or cinnamon. Add 2 tablespoons milk and the softened butter, mix well. Sprinkle half of flour mixture over wet ingredients. Mix lightly with spoon/spatula. Combine the rest, being careful not to over-mix. Pour batter into prepared dish. Cover with fruit. Bake for almost one hour. The center may seem a little raw, but it will solidify once it has cooled down. And irises everywhere -- in time for Memorial Day. In the back yard, more irises, with some lupines poking through. The lupines were planted two summers ago from seed.﻿ The screened-in porch is lovely at this time of year. Also out back are more rhododendrons in white﻿ and purple surrounding the fountain. Stay at the Bridges Inn at Whitcomb House, relax on the porch (perhaps with a glass of wine), or read a book in the gazebo. You can enjoy the gardens and one of Chef David's scrumptious breakfasts! Just down the road from the Bridges Inn, you'll find a nice trail called the Ashuelot River Rail Trail It runs alongside the river, quite scenically, from Keene to Hinsdale, on the Vermont border. Occupying the route of the former railroad, the tracks have been removed but the trail still follows the same path through the woods, passing farmhouses. The trip from Swanzey to Keene is quite lovely. It is about six miles and will bring you by the Cresson Covered Bridge. There are also great views of Mount Monadnock. 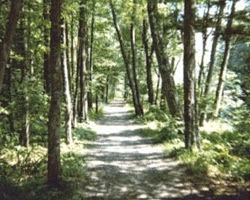 The trail is 23 miles long, most of which is south of the Bridges Inn, in Winchester and Hinsdale. Skipping the Keene portion, bikers leaving the Inn could travel 34 miles (17 miles each way), to the Vermont border and back. Keene is nice, however, particularly if you need bicycle repairs or equipment, as it is home to Andy's Cycle Shop. 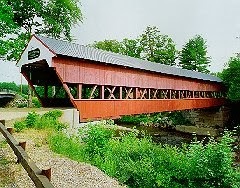 Another popular bike route from the Inn is the Covered Bridge loop. Clicking the previous link brings you to a map with two connected loops, for a total of twenty six miles. It is possible to do other loops, though, of various duration. 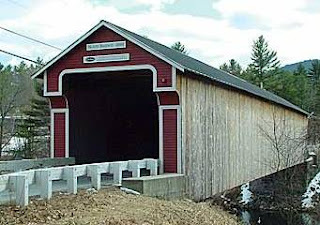 One such route would bring you to Ashuelot to see the most picturesque of the local covered bridges, the Ashuelot bridge. Depending on your pan size, two or three pancakes can be cooking at the same time. We like to serve them with apple sauce. They're good reheated, too (in the toaster oven). Saute onion, carrot, and celery in large skillet over medium-low heat. Add a little oil, salt, and pepper. Cook until browned and tender. Add potato and toss together. Cook for a few more minutes. It tends to stick so you may have to scrape with a spatula or loosen it with a splash of water (Julia Child calls for stock). Serve with toast and poached eggs. Fennel or fresh herbs give it a wonderful flavor. There's actually not very much that doesn't do well in hash. They should be nice and golden on the outside and soft in the middle. Large batches take longer. Sometimes we like to add a beet and/or a sweet potato. As long as the pieces are of uniform size, they can all be treated like a potato. Here in the Monadnock region, we are fortunate to have a strong local economy. There is a great diversity of business, including manufacturing, insurance, tourism, education, and agriculture. We also have groups that support these businesses. One such group is Hannah Grimes, whose mission is to educate entrepreneurs. They offer a wide variety of workshops and other assistance, providing knowledge and a chance to network . And on Main Street they have a marketplace for local products. We tell our guests at the Bridges Inn that no trip to downtown Keene is complete without stopping there. Another group is Monadnock Buy Local (we like them on Facebook). Recently, I met with Jen Risley to get some more information. She explained that they work with local businesses, entrepreneurs, and schools. A lot of their work can be done online, by connecting people and sharing ideas. It sounds to me like they are building social capital and a stronger community. She also recommended that I read a book by a local author, Antioch professor Tom Wessels. It is called The Myth of Progress and helped me to understand some key concepts. Wessels is concise, conveying the feeling of a deep understanding of and connection to the subject matter. By calling into question some assumptions we may hold, he challenges us to be pro-active. Starting today, we can begin to integrate our lives with the community, and we shouldn't wait for a law or someone to tell us to do so. The local economy is a system, better understood as a whole rather than by its individual parts. In fact, Wessels says, "...we are deceived into a sense that we can control things like nature, the economy, or social problems by tinkering with parts." There is strength in diversity. Wessels uses examples from the natural world. In evolution, we see mutualism between species, where everyone gains and the ecosystem is made more resilient. Looking at a system in its entirety, a cheaper upfront price often masks the true costs. "If the price of all products truly reflected the cost in energy consumption related to their production and shipping, energy efficient products would have the lowest prices, and a market system would naturally push for energy efficiency," Wessels tells us. Thus, the initial savings on a cheaper product are fleeting, while the premium we may be paying for a locally-produced product are actual savings in the long-run. As an economics student at Keene State, I've learned that this is consistent with economic theory. Your neighbors are your customers and employees, so aggregate demand is boosted by shopping locally. And sustainability is really just a long-term approach, in which a community is healthy because it can adapt to changes. I was familiar with a few of the names mentioned in Wessels' book, such as Steve Keen and Al Bartlett, and I might add my own, Jeremy Rifkin's Empathic Civilization, if you want to learn more. Wessels also taught me something about Pisgah State Park, right here in our own backyard. At over 13,000 acres, it's second largest state park in New England and home to some old-growth trees. I'll have to go out there and explore! Guests are always asking about the covered bridges. There are six in the area, all quite close together and easy to visit in one loop. The loop is just over 30 miles and can be done in an hour. Click here for printable covered bridge loop directions. The tour begins at the Thompson Bridge, just a few hundred yards from the Bridges Inn at Whitcomb House, where all the guest rooms are named after the local covered bridges. 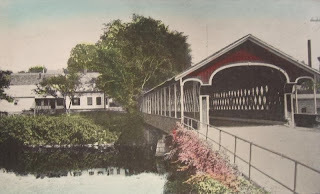 The Thompson Bridge has also been known as the West Swanzey Covered Bridge and the Old Covered Bridge, but today it bears the name of famous Swanzey native Denman Thompson. Continue west on California Street to Route 10. Turn right, traveling north, for a mile. Take a right onto Sawyer's Crossing Road and follow for two miles to the Cresson Bridge, also known as the Sawyer's Crossing Bridge. Continue until you reach a T-intersection with Eaton Road. Go left and soon bear right onto Route 32 heading south. In 1.3 miles, you will reach Carlton Road on the left. 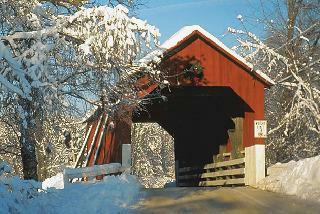 Drive a short distance to Carlton Bridge, which has the cozy feeling of an old barn. Turn around and return to Route 32. Take a left and continue south for a half mile. Turn right onto Swanzey Lake Road. At the end of the road, after 4 miles, you will reach a T-intersection. Proceed left onto Holbrook Avenue. After three-quarters of a mile, make a sharp right onto Westport Village Road. 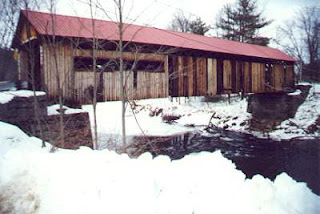 You will pass through the Slate Bridge, which was destroyed by fire in 1993 (left, shown pre-1993) and reopened in 2001 after being rebuilt (right, shown after 2001). This road will quickly lead you back to Route 10. Turn left onto Route 10, traveling south for a mile and a half. Turn right onto Coombs Bridge Road and you will soon come to the Coombs Bridge. Like many covered bridges, the Coombs Bridge is named for its original builder and owner. Turn around and return to Route 10. 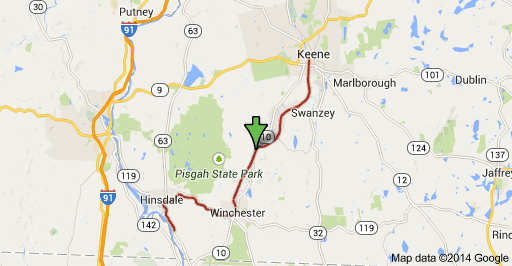 Take a right onto Route 10, traveling south for 5.4 miles to Winchester. At the second traffic light, turn right onto Route 119, heading west towards Brattleboro. Go two miles and the Ashuelot Bridge will be on the left. Considered by local historians to be one of New Hampshire's most elaborate covered bridges, it is 159 feet long, painted white with a red roof. Going back the way you came, turn right onto Route 119, continuing east for two miles. Take a left onto Route 10 heading north. In just over 10 miles, take a right onto California Street, go through the Thompson covered bridge, and the Bridges Inn at Whitcomb House is the fifth house on the left. 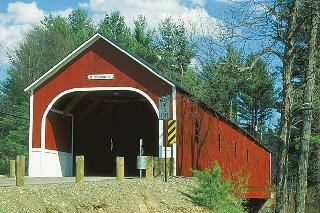 Click here for additional information on The Covered Bridges of Southwest New Hampshire. There are at least three old cemeteries in Swanzey. Today I visited the one in Swanzey Center at Mount Caesar. If it looks cold, that's just because of the snow. For someone moving around, it was quite comfortable. He only had two children, with his first wife, and married his last wife when he was 75 years old. Adrienne Naylor, a guest of the Bridges Inn, has been doing research on Mary Whitcomb based on an unidentified diary that she found at the Boston Public Library. Would wife number two be the same Mary Whitcomb? 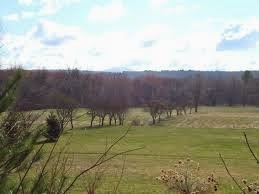 Mount Caesar is a small hill in Swanzey Center. There's a short trail up to the top of it, less than an hour round trip. It's a very nice hike with a panoramic view like you'd expect on a taller mountain. The Swanzey Airport can be seen on the left and the Bridges Inn is somewhere on the right, though not distinguishable in the photo. A historical tour of Swanzey's old cemeteries along with presentations on the history of Swanzey will be part of the annual Swanzey Old Home Day program, which is scheduled for Saturday, July 21, 2012. Mark your calendar and watch for details! Looking at Swanzey, you can almost see two distinct towns. One is the Swanzey of old, with a strong manufacturing base. For almost two hundred years, people worked with the resources at hand: wood and wool. But that Swanzey ended around 1984, creating the town we see today. The Bridges Inn is located in the Whitcomb House. Construction on it began in 1792 by a Mr. Richard Stratton. There was a Stratton Woolen Mill and the town library still bears his name. The house was sold to Roswell Whitcomb in 1841. The Whitcombs were another local family and they operated a saw mill. Continuing to work with lumber, they ran a box factory. However, in the early 1980's, amid tension between labor and management, the factory burnt down. Part of the building remains today and a craftsman uses the space for a forge. In 1918, the family built Whitcomb Hall. It was involved in recruiting soldiers for World War I. At some point, ownership was transferred to the town. The hall thrived as a community center. People would go there for meals (Whitcomb Hall china still exists!). There was a stage for performances and even a basketball court. Children attended pre-school and adults voted there. Sadly, it is condemned today, but there is a movement afoot to restore it. 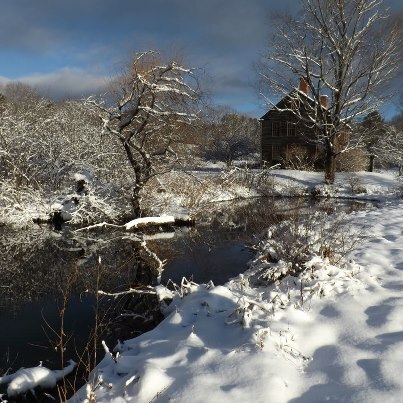 Next to the Ashuelot River, harnessing its energy, was Homestead Woolen Mills. The building currently houses Tree-Free Greetings and was previously home to Trikeenan Tileworks. Recently, the state removed the dam, allowing for over twenty miles of uninterrupted river. Homestead Mills must have thought that they survived the recession when, in 1983, the interest rate fell. They took out a large loan to build a loading dock. A gas station had to be knocked down and traffic rerouted. But by the time construction was complete in late 1984, the mill was out of business. The woolen mill and the box factory closed at approximately the same time. Swanzey lost well over a thousand jobs. Two local businesses suffered immediately as a result. Gomarlo's Food & Circus and Nick's Restaurant (pictured below are their former abodes, Gomarlo's on the left and Nick's on the right) were located across the street from the mill. Both were owned by local families who had a long history of serving the community. They adapted quickly, building new facilities on Route 10, where they are located today, still operated by the same owners. The railroad came through Swanzey until not too long ago. Children would wait for it after school. As it passed, the conductor would toss out candy. Today the tracks have been replaced with a bike path to Keene. Perhaps the thing that I would most like to have seen are the Scarlet Marauders, a drum and bugle corps. It was like a parade every weekend. They would practice and march around the block. They competed in national competitions and won their fair share of events. Some of their uniforms are on display at the Swanzey Historical Museum. Have you ever driven through Milford on Route 101 and wondered about the building with welded-scrap-metal dinosaurs and a banner that reads "Let us keep on rocking in the free world"? Well, that is Hollis Line Machine Company. What they mean by rocking in the free world is to keep manufacturing jobs in America. Hollis Line is a huge place with cranes in the ceiling to move around massive pieces of metal. There are large sheets of metal to feed through rollers and make into cylinders. They have milling/lathe machines to make individual parts. At welding stations, it is all assembled together into a single product, which is then sprayed with aluminum and fired in a 2300 degree oven. Timothy Gregory was nice enough to show me around. I saw some of the finished pieces. They were on their way to Korea, to be installed in furnaces. The furnaces make synthetic crystal and sapphire, used in semi-conductors and shatter-proof glass. The Korean companies export most of these synthetic materials back to the US. I mentioned that it makes a nice loop. Tim corrected me, saying that the work should stay in this country. I pressed him to elaborate. Why did the jobs leave? Who sent them to foreign countries? I was fishing for a villain but alas, the world is not so simple. "You have no idea how hard it is to survive in this industry," he replied. I also had no idea about New Hampshire's nearly two-hundred year history as a pioneer in the machine tool industry. Today, it still has a worldwide reputation as a leader. I went to Hollis Line to learn more about the history, because it houses a display by artist and machinist Patryc Wiggins. She has done a lot of research and interviewed numerous machinists to tell this untold story. On the left, there are many examples of what has been manufactured in New Hampshire over the years, from golf clubs to missile parts to door locks. On the right is a wax mold, which is dipped several times into ceramic. The wax is then melted out and the mold filled with molten metal. Keene is home to the machine industry as well. Markem makes printers to label products. And several firms manufacture optical products. This precision work, using diamond-turning machines, is quite a bit different from what I saw in Milford. Once it opens for the season, I am going to have to visit the American Precision Museum in Windsor, Vermont! Update: link to CNN article on professional machinists.